*Please Note: Peach Shipping for 2018 has closed. We will begin pre-orders for next year in June of 2019 for shipping in August 2019! Thank you for another great Peach Season!! Give the gift of High Country Orchards' Fresh Tree Ripened Peaches! Delight yourself or your friends with a beautifully packaged gourmet gift box, shipped directly from High Country Orchards in Palisade, Colorado! Choose from our preserves and salsas to create a unique gift! 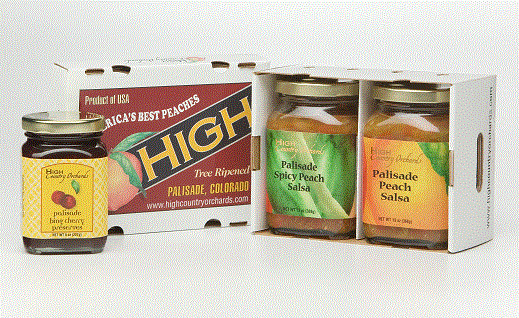 *Please note that the Palisade Peach Preserves & Salsas Gift Box is specially packaged in quantities of three jars per package. Please choose three jars per package.